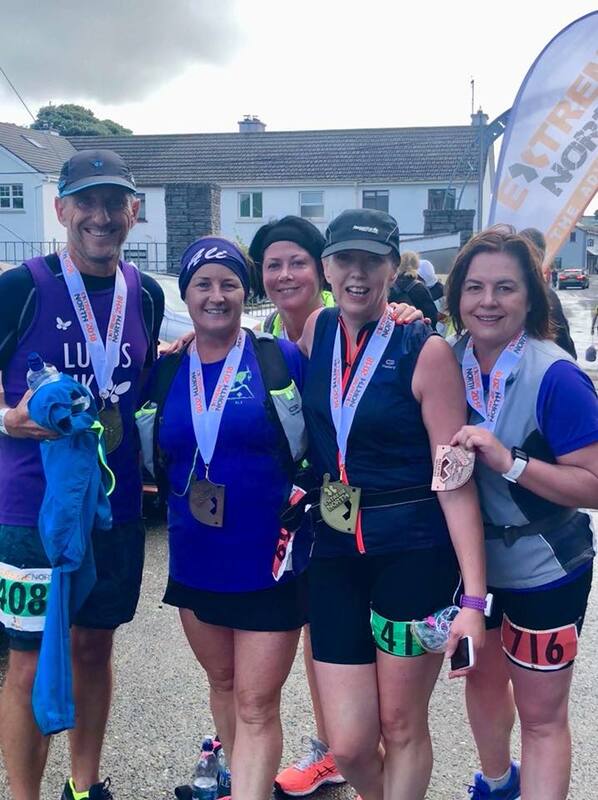 The Quadrathon, organised by events management company Extreme North is a four day festival of running around the Inishowen peninsula in Donegal, with competitors having a choice of four marathons or half marathons. This year’s event took place from 16th – 19th August with the local competitors being joined by runners from England, Scotland, France, Germany, Belgium and the United States of America. 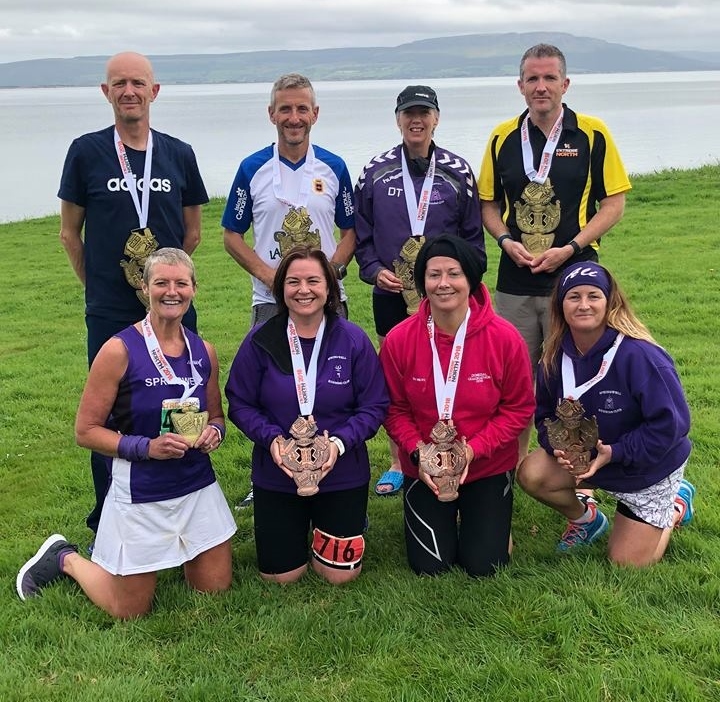 The first day’s marathon started in Moville with the race following the coastline through Greencastle village before beginning a two mile climb with 900 feet of elevation, before a steep 2.5 mile descent to Kinnego Bay and the start of the Half Marathon. The course then has another steep climb out of Kinnego Bay and follows the country roads through Culdaff Village and onto the finish in Malin. The weather was a mix of wind and squally showers with low lying cloud at times obscuring the spectacular views of Inishowen. Springwell Running Club was well represented at the event this year with five in the marathon and three in the half. In the Marathon it was the experienced distance runner Helena Dornan who was first home for Springwell RC, finishing in 4.00.54. Bob Purcell was next in 4.08.36 before John Butcher and Nigel McNeill crossed the line in 4.30.26 and 4.34.54 respectively. Debbie Tutty, whose efforts were also raising much needed funds for Cancer Research UK finished in 5.27.55. In the Half Marathon it was Alison McAllister first in for Springwell RC in 2.32.48, with Rebecca Clarke crossing the line in 2.45.02, closely followed by Zara Hunter in 2.46.18. Day two’s Marathon started and finished in Malin with the runners completing an anticlockwise loop of the headland. Four miles from Malin the route joined the Wild Atlantic Way and followed the rugged coastline to Pier Road and the start of the Half Marathon, before continuing to Banba’a Crown, Irelands most Northerly land point and the major climb of the day. Although not as much elevation as Day One with only 600 feet of elevation, there was still two miles of climbing before the final five miles of descent and flat roads back into Malin. Once again it was to be a day of wind and rain but this did little to dampen the enthusiasm of the Springwell brigade. Day two was to establish a pattern for the next few days with only seconds separating Helena and Bob in each race. Day two’s finish saw them separated by four seconds with Bob finishing in 4.02.22 and Helena in 4.02.26. Nigel was next to finish in 4.11.56 while John crossed the line in 4.14.40. After a long wet and windy day Debbie finished with a time of 5.38.54. In the Half Marathon Rebecca was the first in for Springwell in a time of 2.42.05, with Zara and Ali following in 2.44.21 and 2.55.36. Day three’s marathon started in Malin and made its way through Carndonagh, Ballyliffin and Clonmany on a relatively flat course to the start of the Half Marathon in Tullagh. The runners then had another flat 4 miles in which to prepare themselves for the climb through the Mamore gap. Very few can run this 1.2 mile climb over the 880 feet of elevation with its steep first and last increments, the majority resort to walking or crawling to get to the top. The remaining 9 miles took the competitors onto the coastline at Ned’s Point before finishing at Buncrana Youth Club. The weather was more of the same with runners being drenched by heavy showers before and during the race. Following Day two’s pattern, Bob and Helena were once again separated by just second with Bob finishing in 4.10.17 and Helena in 4.10.26. Nigel finished in 4.15.12 and John in 4.26.20 while Debbie had her longest day yet, finishing in 6.31.20. In the Half Marathon Ali McAllister finished with a time of 2.47.33, Zara crossed the line in 3.01.14 and Rebecca wasn’t far behind in 3.03.00. Each day’s event has its own bespoke medal with all four medals connecting together to form one giant medal, so no matter how tired the body was after three days of challenging runs everybody wanted that final piece of ‘bling’ to complete the set. Starting in Buncrana day fours marathoners had 7 miles of flat running along the banks of Lough Swilly before crossing to Muff Village and the start of the Half Marathon. The flat theme of the day continued as the course made its way along the banks of Lough Foyle, passing Quigley’s Point and Redcastle to the finish in Moville. Day fours marathon saw the first sub 4 hour times and once again Bob and Helena were separated by just seconds with Bob finishing in 3.55.54 and Helena in 3.55.59. Nigel also finished in less than 4 hours with a time of 3.58.48 with John taking 4.06.58 and Debbie 5.51.00. The Half Marathon numbers were joined by Gael Butcher and Amanda Kershaw for the day and their fresh legs saw them finish together in 2.11.01. Ali was next home in 2.20.20 with Zara and Rebecca finishing in 2.40.08 and 2.40.09. In the overall standing Helena Dornan cumulative efforts saw her finish 2nd Lady overall and Bob Purcell won the M50 age category. After the very serious risk of cancellation because of poor air quality due to the forest fires in British Columbia, a change in the wind direction resulted in a last minute decision for the race to go ahead on Sunday 19th August. Springwell RC’s two representatives at the event had a very successful day with Simon Stewart running a new club record of 1.13.14 to finish 11th and win the M40 age category, while Mekita Aznar finished 62nd overall and was 2nd in the F40 age category in 1.27.58.